Preliminary results of 2018 confirm the trend for the beer production stabilization. The decline that started as far back as 10 years ago and went even steeper in 2014-2015, seems to have stopped. But one should hardly expect a considerable market growth in the coming years. Unstable volume growth was set off by higher selling prices by big and regional brewers. 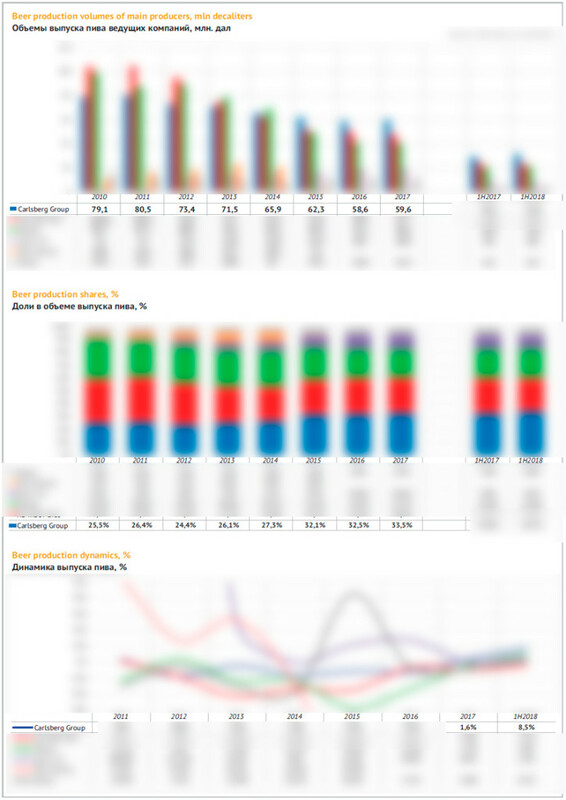 Carlsberg Group stands out from the market leaders by their positive dynamics improvements of the product mix. Growth of Obolon was provided by export contracts. AB InBev Efes so far have not managed to climb into positive territory. In 2017, the beer output fell only by 1% to 182 mln dal (including 2.8 mln dal of alcohol-free beer) according to the final report by Goskomstat. The trade balance that can be considered the market volume, looks a little worse than the output. The inner consumption fell last year even lower by 2.5% to 170 mln dal, as more beer was taken out of Ukraine than into it. The urban retail audit data by Nielsen show that the Ukrainian beer market stopped declining in 2017 having showed a 1.8% growth for the first time in ten years. Besides, let us cite the inner estimation by Carlsberg Group according to which the volume of Ukrainian beer market in 2017 stabilized (with a growth at the level of +0.1%). At the moment of article preparation, it was already obvious that despite the output dynamics fluctuations the current sales season was positive and during the first three quarters of 2018, the beer output increased by 2.5%. In 2018, the export has continued growing rapidly, but the import has been growing much faster. The difference between them though remaining negative, but has decreased against the last year. Thus, the inner consumption grew by 3% over the three quarters of 2018. What supported the branch in 2018? In a nutshell, the answer will be better consumption sentiment, hot weather, football championship and export contracts. 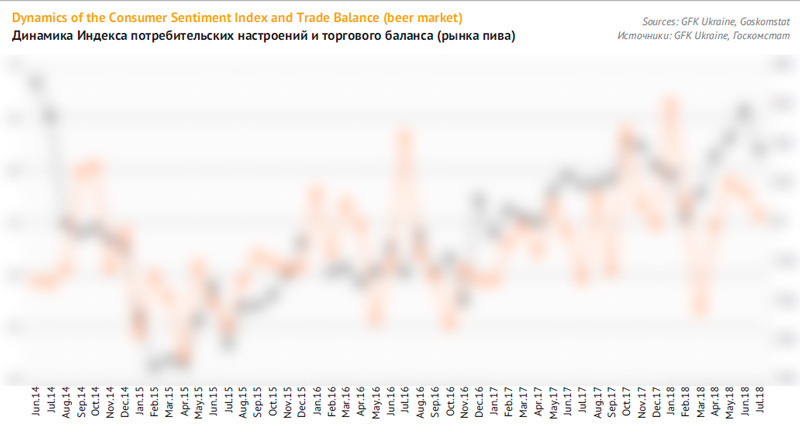 The influence of economy situation on the beer market is well expressed by the graph consumer sentiment index, calculated by GFK Ukraine as well as by off-line dynamics of beer consumption. Naturally, the beer consumption is closely connected to estimation of material condition of people and their willingness to make purchases. After a sharp decline of consumer sentiment index, as it hit the bottom in 2014, it remained very low during 2015-2016, when the period of two-digit market decline. And no sooner than in 2017, consumers’ optimism started recovering. The dynamics was uneven, we for example can notice that consumer sentiment index declined sharply in February-March 2018, the beer production also dropped at that time. But as soon as in April, the level of consumer sentiment index recovered, so the beer consumption growth this year is much impacted by people’s higher willingness to spend money. The second positive factor is weather that was warmer in spring-summer than last year and favoured brewers. April and May 2018 were unusually warm and the difference with 2017 was quite obvious. This probably drove beer sales in May and better material self estimation of Ukrainians gave some synergy to this phenomenon. Football championship FIFA 2018 that took place 15 June-15 July also contributed into beer sales support. For instance it is known that 6.7 mln people in Ukraine watched the world championship on TV. Obviously the market growth in June was associated to prognosed higher consumption by football fans. Besides, the beer output growth was supported by export supplies mainly by Obolon we will speak about in the chapter on companies. Till 2014, the export share amounted to nearly 10% of the Ukrainian beer output, and the bulk of it was sent to Russia. As that supply direction was blocked, the significance of export for brewing industry went down. In 2015-2016 only 3.5% of output volumes was shipped abroad. However, the active search for new market outlets and quite competitive price allowed to increase the beer export by nearly 50%. At that time its share in the total output volume grew to …%. In the first half of 2018 the rates of export growth remained high which expanded its share to …% in the total output volume. One cannot say that the above mentioned factors are fundamental as they are exposed to risks and do not create a long-standing base for growth. For the period till the end of the year, the last year base effect will be neutral. Production and market will depend on weather and consumer sentiments. Probably, by the end of 2018, the production will increase by 2-3% but it is too early to call this situation a transition from stagnation to growth. Currently one in our view can speak of the output volume stabilization that can be easily changed both in positive or negative way in the coming years. Especially if we compare alcohol beer to other beverage categories, several growth percent will look too poor. The production of alcohol-free beer, kvass, mineral water, and CSD has grown by nearly …% in each category during the three quarters. Taking into account the general for drinks demand, which was boiling at summer heat, the beer production growth could have been bigger. In spring 2018, (like in the previous spring) brewers raised their selling prices. However, unlike in 2017, when after the price raise producers’ prices stabilized, this year, they were growing quite rapidly till the beginning of summer. In September 2018, they equaled …* hrn for a liter and were …% higher than in September 2017, and producers’ prices have grown by …% since the beginning of 2018. * Here producers’ selling prices are cited without VAT and excises. Judging by the selling prices and our prognosis for the rest of 2018, we can assess that producers’ revenue from beer sales in 2018 will grow by …% to … billion hrn. In dollars it amounts nearly $… mln with a growth of nearly …%. Naturally retail prices for beer followed producers’ prices. In September 2018, the average beer price increased by …% compared to the last year and by …% compared to the year start. The retail beer price was kept down by comparatively weak growth of consumer prices, that rose only by …% from December 2017 till September 2018 according to Goskomstat data. Judging by the current trends, one can say that the weighted average beer price in 2018 will increase by …% till … hrn for a liter. In dollars the price will rise by …% to $… for a liter. Basing on the average prices and our assessment of the beer market volume, one can expect the market by value to increase by …% and reach … billion hrn in 2018. In dollars because of hrivna devaluation, the beer market will increase by …% to $… billion. In the first half of 2018, Carlsberg Group expanded beer output by …%, to … mln dal having much exceeded the average figures for the branch. Thereby the company has made a significant contribution into the growth of Ukrainian market. Let us note that in less optimistic year of 2017, Carlsberg Group stood out for their output growth by …% having left other Ukrainian brewers behind. The outrunning growth of beer production means trend continuation of Carlsberg Group share increase in the total output volume. During the first half of 2018, it grew by … p.p. to …%. The company output structure in 2017 remained nearly at the level of the previous year, that is, …% is accounted for by beer, …% is taken by soft drinks, mainly kvass, and …% belong to cider. Though mere three years ago there was a rapid diversification, that is, beer share was falling. However, in the first half of 2018, Carlsberg Group expanded their output of soft drinks (including kvass output growth by …% to …mln dal). By doing so the company kept their …% share in the total output volume of kvass and the absolute leadership among producers. The main impact was done by wide distribution of Kvass Taras during summer season, product range (several sorts and package types) as well as comparatively affordable prices. Besides there was continuation of two-digit growth of alcohol-free beer, mainly due to growing popularity of alcohol-free version of Carlsberg. In the first half of 2018, the growth amounted to …% to … mln dal. The company’s share in the total output of alcohol-free beer increased by … p.p. to …%. Carlsberg Group also leads this category. Average selling prices for beer of the both branches of Carlsberg Group rose by nearly …% if we compare prices cross-sections for July 2018 and June 2017 which corresponds to Ukraine average figures. And the level of prices in general corresponds to the average for Ukraine due to price rises by regional brewers. Carlsberg Group’s average prices increase was in many ways connected to improvement of product mix as the share of premium brands by the company expanded both in the market and in the company’s portfolio. In 2017, the premiumization was driven by … and …. In 2018, the main contribution into this process is obviously done by … subbrand that is obviously gaining ever bigger weight in …. Besides, in summer 2018, there was registered a local growth of Baltika and Tuborg market shares, yet, time will show how stable that growth is. The volume growth multiplied by the price rise due to positive product mix rather positively impacted the company’s revenue in 2017. Let us remind you that then the company revenue not taking indirect taxes into account increased by …% to … billion hrn by Ukrainian accounting standard (or approximately by …% to $... mln). 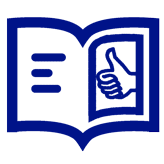 The net profit grew by …% to … billion hrn (or approximately by …% to $... mln). Estimating the outlooks of the company market share growth by the end of 2018, one should notice the high base effect of the second half of 2017, which means that Carlsberg Group volume growth in Ukraine will be lower than in the first half of the year. However, the positive price mix is likely to cover for the influence of physical indicators on revenues. Company AB InBev Efes in the first half of 2018, decreased the beer output by …% to … mln dal which looks twice better than the performance in 2017. Yet, despite the positive dynamics in the branch, the company still has not overcome the lingering trend of output volumes reduction. Thus, against the background of the general growth of Ukrainian beer production, AB InBev share fell by … p.p. to …%. 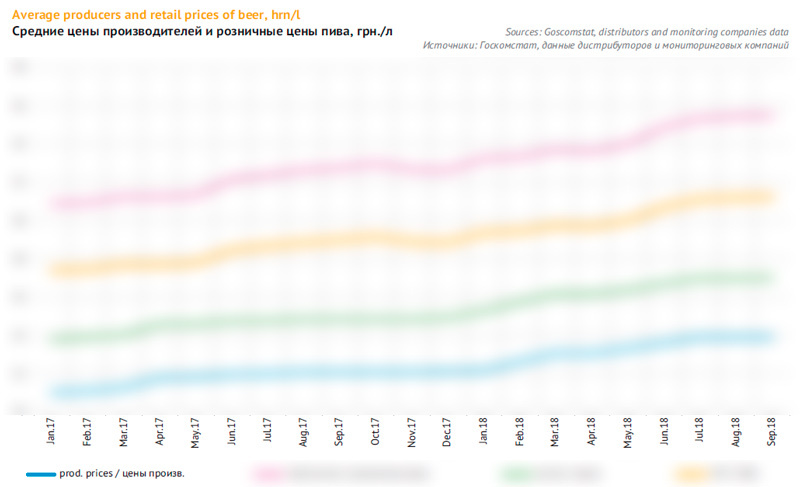 If we compare the cross-sections of selling prices for July 2018 to last year data, one can notice fast growth at the biggest AB InBev Efes subsidiary located in Kharkov (by a …), a small growth in Chernigov (…%) and some reduction in Nikolaev (…%). Besides, let us note that in the first half of 2018, at Kharkov subsidiary the volumes increased by 6% while in Chernigov and Nikolaev the volumes fell by … and …% respectively. Such volumes and prices dynamics is obviously formed due to AB InBev Efes focused on production of premium brands in Kharkov (in particular beer Bud). 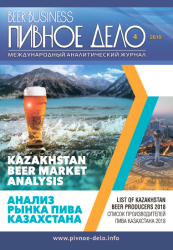 Brand Chernigivske is still the key brand by AB InBev Efes and the Ukrainian market leader with a share of nearly …% in summer 2018. 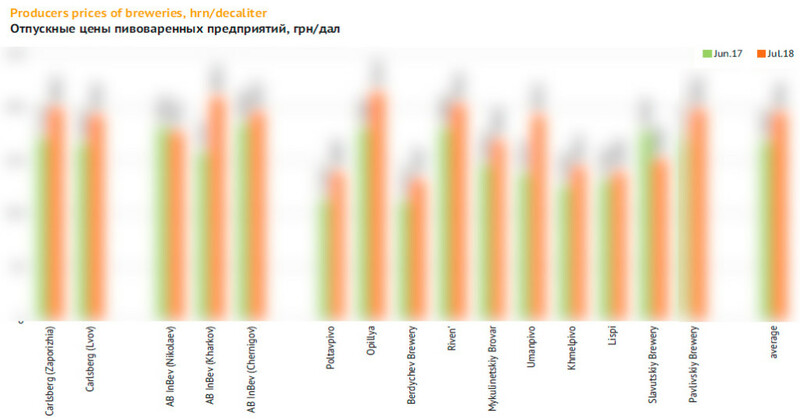 The market share of the brands has stabilized in the recent years due to shifting to the economy segment (in the first place due to sort Svetloe in PET). This year, AB InBev Efes market share can be supported by Bud brand which is already laying claim for the second position in the company portfolio and for the trading positions in the premium segment of Ukrainian market. We should also note summer sales increase of beer Zhigulevskoe which can be attributed both to pricing policy of the company and the general trend of the consumer core shifting towards older audience. In the first half of 2018, alcohol-free beer by AB InBev Efes went …% up to … mln dal. And at the same time, the company’s share in the total output volume of alcohol-free beer decreased by … p.p. and amounts to …%. Obviously the outlooks for further development of the company are linked to returning of popular brands (that disappeared as Efes brewery in Donetsk stopped operating) to the Ukrainian market. In July, Velkopopovicky Kozel entered the Ukrainian market again and in August Miller Genuine Draft returned. In 2013 these brands respectively were positioned in premium and superpremium segments with market shares of …% and …%. License brands of Russian origin were weightier: Beliy Medved (…%), Zolotaya Bochka (…%), and Stary Melnik (…%). One cannot either exclude a possibility of returning Sarmat brand that can be conventionally referred to as nostalgic series. One way or another AB InBev Efes market specialists emerged a possibility to adapt the portfolio and expand the market share. In 2017, the revenue of AB InBev Efes from production sales without indirect taxes increased only by …% to … billion hrn (…% in dollars approximately to $... mln). At the same time the net loss increased threefold – to … mln (or to $... mln). 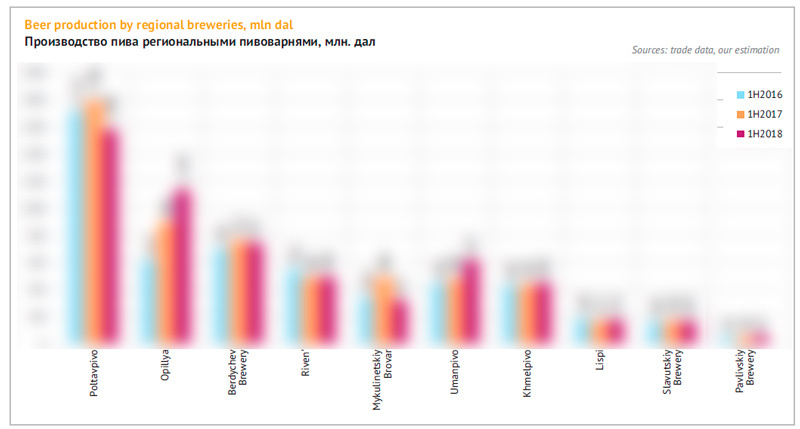 These figures do not look satisfactory against the performance of other Ukrainian brewers. Possibly, expanding portfolio and focusing to its premium part will help AB InBev Efes to improve the product mix and financial in this or coming year. Obolon company has gradually managed to overcome the lingering production decline. In the first half of 2018, it increased output by …% to … mln dal. Thus, the share of Obolon in the total output volume has grown by … p.p. to …%. However, we should immediately say that under our estimation, the volume growth of Obolon is in the first place connected to recovering of the export direction while supplies to the inner market have probably shrunk by several percent as well as the market share. The summer season will probably help improve the situation in the Ukrainian market due to the sales volumes of key economy brands by the company. In the first place they are … and …, that have already won more than half of the company’s sales and pressed the title brand considerably. In the first half of 2018, Obolon increased the output of alcohol-free beer by …% to … mln dal. Yet the most prominent was the output growth of soft drinks – by …% to … mln dal, that is, their share equals nearly a third of the net production volumes. Which includes kvass output increase by …% to … mln dal. In this category the company is confidently holding the second position on the market. According to unaudited statement data, due to the general increase of the company sales volume and price raises Obolon has finally managed to climb into positive territory also from the financial standpoint. In 2017, the company raised their revenue (without indirect taxes) by …% to … billion hrn. In dollars the growth reached nearly …%, to $... mln. 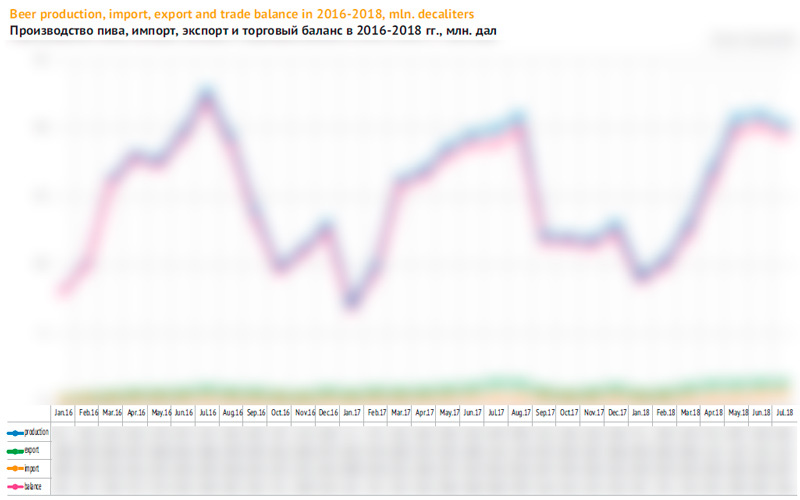 And Obolon managed to gain … mln hrn of net profit ($... mln) against … mln of losses ($... mln) a year before. In 2018, due to rising beer and beverages production volumes, one should obviously expect even better financial performance. 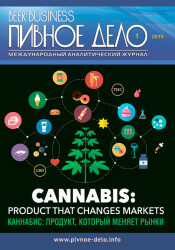 Yet the revenue is still pressed down by sales shifting towards low-marginal brands and company’s orientation to producing private labels for Ukrainian and Belarus retail networks. The output dynamics of other brewers was multi-valued and neutral in general. By our approximate estimate, during the first half of 2018, the output volumes of Oasis CIS (Persha Pryvatna Brovarnia) increased by several percent. This company, that to a large extent focuses at premium and mainstream segments, has to stand against a straightforward price competition from mass brands and balance between margin and volumes. Most of regional brewers have notably raised selling prices. At the same time their production dynamics was multi-valued which led to neutral general result. The fifth by volumes Ukrainian company Poltavpivo decreased volumes by …%, which could have been connected to rising producer’s prices by …%. Besides, there was a …% output decline at Mikulinetskiy Brovar, but in the future the production will probably recover due to launching a new line of can beer filling. Volumes and share of regional producers stabilized by Ternopol brewery Opillia (…% growth) and Umanpivo (…% growth). Ukrainian craft brewing is gaining power. In summer, there were a lot of messages on opening new mini-breweries of different size or expanding production at existing breweries. In 2018, there will probably be 20 breweries more. We should also pay attention to a new ambitious player, as Fanatic Brewing Center located in Dnepr city is approaching mainstream regional brewery by its capacity. 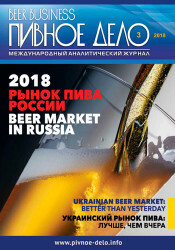 To get the full article "Ukrainian beer market. Better than yesterday" in pdf (13 pages, 12 diagrams) propose you to buy it ($25) or visit the subscription page.